The space shuttle Atlantis will make one final trip to its Florida launch pad tonight (May 31) as NASA prepares the orbiter to launch the last mission of its 30-year shuttle program on July 8. The shuttle's rollout, set for 8 p.m. EDT (0000 GMT Wednesday), also comes on the eve of the final landing of Atlantis' sister orbiter, Endeavour. Endeavour is slated to return to Earth at 2:35 a.m. EDT (0635 GMT) on June 1, carrying six astronauts home after a 16-day mission to the International Space Station. "It obviously makes the significance a little high because it’s the last landing for Atlantis and the last scheduled rollout ever," NASA spokesman Allard Beutel told SPACE.com. "Put those two together, that makes it unique." Atlantis will be slowly rolled from the gigantic Vehicle Assembly Building (VAB), where the orbiter was attached with its external fuel tank and solid rocket boosters, out to launch Pad 39A, where it is scheduled to lift off one final time on July 8. The orbiter was moved from its hanger, called the Orbiter Processing Facility, to the VAB on May 17. The crew of STS-135, NASA's final mission for its space shuttle program, pose in front of their spacecraft, space shuttle Atlantis on May 17, 2011. From left to right: mission specialist Rex Walheim, commander Chris Ferguson, pilot Doug Hurley and mission specialist Sandra Magnus. It will be the last mission not just for Atlantis, but for NASA's 30-year-old space shuttle fleet. The shuttles are being retired to make way for new spacecraft NASA plans to build to take humans to an asteroid and Mars. 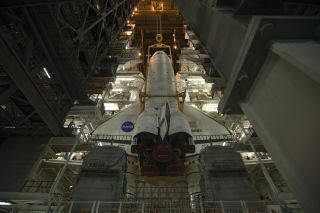 Discovery completed its final mission in March, while Endeavour is wrapping up its own last spaceflight this week. As the end of an era, this final rollout, and certainly Endeavour's landing, will be emotionally charged. "As opposed to being sad, I think it's more people wanting to be a part of the finale of the space shuttle program," Beutel said. "Maybe we'll start feeling the sadness at other times. People want to experience it and be a part of space exploration history." Atlantis' STS-135 mission will carry four astronauts and a cargo bay full of spare parts to help outfit the space station for a long life after the shuttle era. Following Atlantis' flight, NASA astronauts will have to rent seats aboard Russian Soyuz spacecraft to travel to the orbiting laboratory, until U.S. commercial spaceships are ready to start carrying people. To help commemorate Atlantis' journey to the launch pad, the shuttle's four person crew — NASA astronauts Chris Ferguson, Doug Hurley, Sandy Magnus and Rex Walheim — will answer reporters' questions and pose for a photo op in front of the moving shuttle Tuesday night. NASA has never before brought a shuttle's crew out for a media opportunity during rollout. With the shuttle fleet retiring, NASA is developing a new spacecraft for deep space exploration, called the Multi-Purpose Crew Vehicle, for the new exploration goals. The capsule-based spacecraft is expected to make its first operational flights in 2016, so NASA plans to rely on Russian Soyuz spacecraft and private U.S. vehicles to ferry crews to the space station until then.